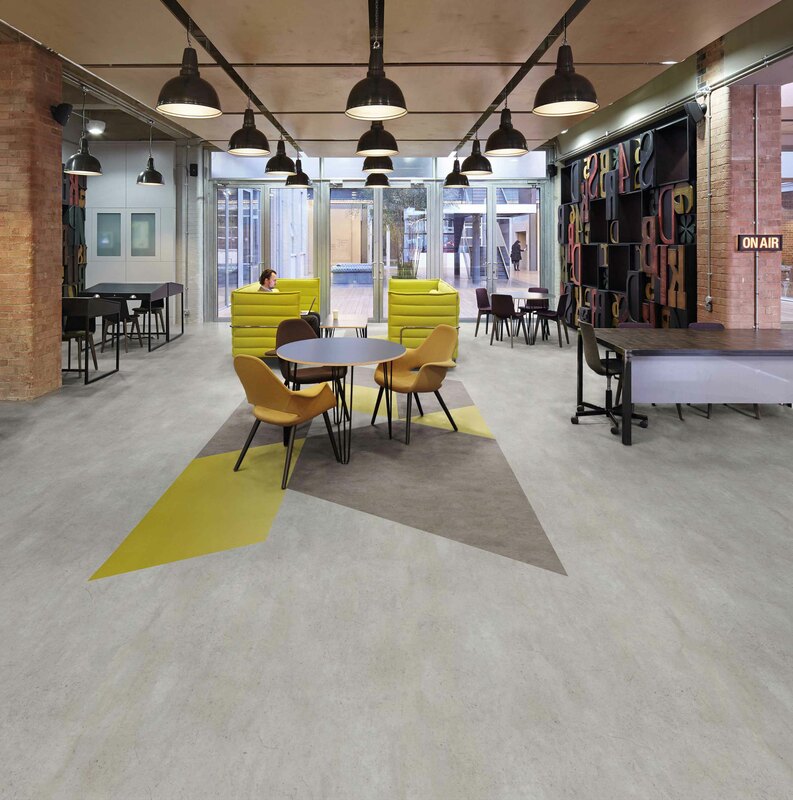 Silentflor is a robust, beautifully designed collection that achieves 19dB impact sound reduction and has been expertly created for a wide range of commercial interiors, such as installations in the healthcare, office, education, residential, retail and leisure sectors. Made in the UK, this flooring range includes 36 stunning designs in a 3.7mm gauge and 0.65mm wear layer sheet format. Skilfully portraying the natural beauty of timber planks, the 16 Silentflor wood effect designs replicate a variety of stunning wood species and grains including oak and ash patterns, chevron design floors and limed wood effects. The collection’s 8 contemporary concrete and 12 abstract designs have been specifically developed to achieve a modern on-trend look. The variety of shades available include subtle neutral tones and stronger accent colours to create an appealing floor covering that is both fun and functional. The Silentflor range can assist in improving the acoustic properties within busy commercial and public locations where excessive noise can be detrimental to the people using the facility. The product’s acoustic layer provides warmth and cushioning underfoot as well as reducing the effects of impact sound travelling through a building, such as the slamming of doors and footsteps from upper levels. The Silentflor collection is enhanced with Polyflor PUR, Polyflor’s exclusive and robust polyurethane reinforcement which is cross linked and UV cured to provide superior cleaning benefits. This PUR enhancement offers a cost effective, low maintenance regime that is both environmentally friendly and ensures longevity as poor maintenance can impair performance, shorten floor life and create hygiene problems in critical areas. The new Silentflor collection is beautifully presented within a sampling package which includes a 40-page brochure, a comprehensive presenter and shadecard. Sampling can be ordered free of charge on the Polyflor website or by calling the Polyflor Samples Direct Hotline on 0161 767 2551. Silentflor’s environmental credentials are impressive, achieving a BRE A+ rating in major use areas and Indoor Air Comfort Gold, assuring that VOC emissions are below any globally determined levels. Silentflor is 100% recyclable via the Recofloor recycling scheme and also contains recycled content.